Product prices and availability are accurate as of 2019-04-18 20:08:39 EDT and are subject to change. Any price and availability information displayed on http://www.amazon.com/ at the time of purchase will apply to the purchase of this product. 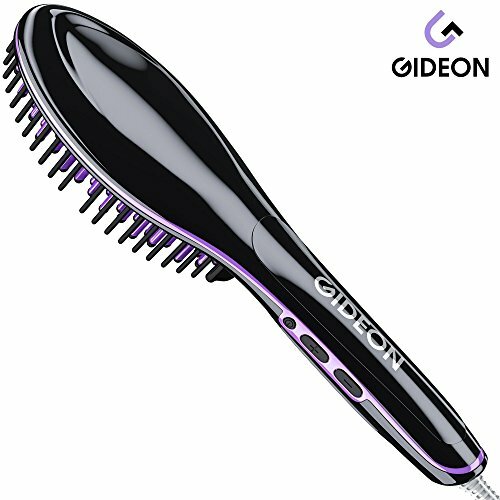 The GideonTM Heated Hair Brush Straightener gets the hair straight 10 times faster than traditional iron straighteners. Simply brush your hair straight! It takes only an average of 2-3 minutes of brushing to get your hair straight; and it will last for the entire day. With the GideonTM Heated Hair Straightener Brush creating smooth, silky, and sleek straight styles is fast and easy. No need for clips or to divide hair into subsections; the uniquely designed wide 3D ceramic plates allows for large parts of hair to be straightened simultaneously, achieving better results, while saving time. 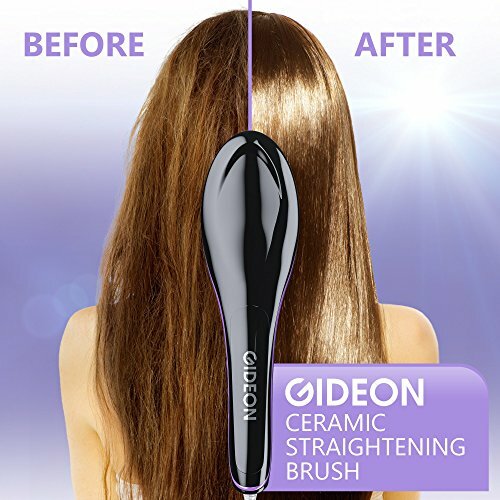 The GideonTM Heated Hair Straightener Brush is made of high quality materials, and was developed based on revolutionary technology, including a very unique 3D ceramic surface design. Heat temperature LCD screen display is clear and easy to read, and can be set to work in Fahrenheit or Celsius. Easily adjust to your desired temperature. Temperature range is 176°F - 446°F (80°C - 230°C) which is healthier for your hair and enables you to effortlessly look great. The GideonTM Heated Hair Straightener Brush is designed to be extremely safe and to prevent burns. The heated ceramic plates feature a rubber tip and the entire area is surrounded with hard plastic bristles. It features also an auto-shut off safety; the unit will shut off after 60 minutes of not being in use. Features also a 360 swivel cord that keeps the cord untangled, ensuring a safer and hassle free experience. Auto shut-off: After 60 minutes of non-use. STRAIGHTENS WHILE BRUSHING - The Gideon™ Heated Hair Brush Straightener gets the hair straight 10 times faster than traditional iron straighteners. Simply brush your hair straight! It takes only an average of 2-3 minutes of brushing to get your hair straight; and it will last for the entire day. EASY TO USE - With the Gideon™ Heated Hair Straightener Brush creating smooth, silky, and sleek straight styles is fast and easy. No need for clips or to divide hair into subsections; the uniquely designed wide 3D ceramic plates allows for large parts of hair to be straightened simultaneously, achieving better results, while saving time. / Temperature range is 176°F - 446°F (80°C - 230°C). NO SNAGGING & PULLING - The Gideon™ Heated Hair Brush Straightener tames unruly and tangled hair; helping to detangle the hair without any need for detangling sprays and conditioners. 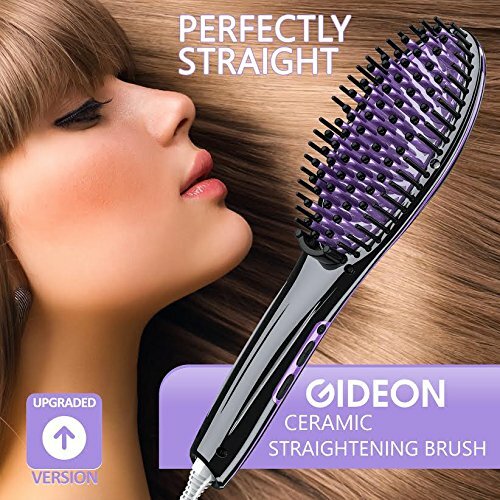 SAFE - The Gideon™ Heated Hair Brush Straightener is safe to use for all types of hair; including chemically-treated hair, permed and colored hair. REDUCES FRIZZINESS & STATIC - Features technology that reduces frizziness, while boosting style control. Upgraded with advanced components for better results.